SAN DIEGO - The crew of the guided-missile cruiser USS Princeton (CG 59) received the 2017 Spokane Trophy during a ceremony aboard the ship, Oct. 19. 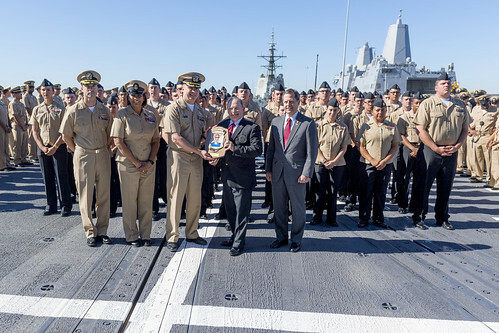 The Spokane, Wash., Council of the Navy League of the United States sponsors the annual award, which is presented to the U.S. Pacific Fleet surface combatant ship considered to be the most proficient in overall combat systems readiness and warfare operations. 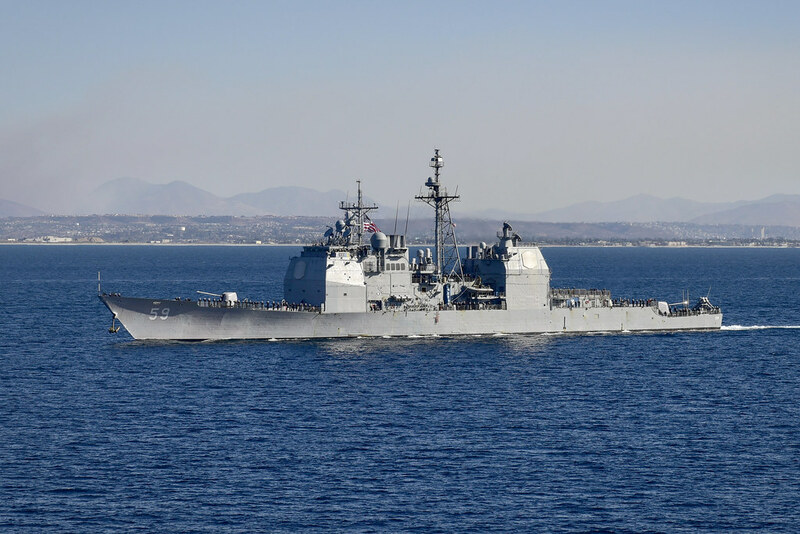 The award recognizes a ship’s demonstrated ability to fully conduct, on a sustained basis, simultaneous and coordinated Air Warfare (AW), Surface Warfare (SUW), and Undersea Warfare (USW) operations with all installed equipment. This is the third time Princeton received the award. Ivan Urnovitz, president of the Spokane Navy League, came from the Pacific Northwest to present the award. This award is the most prestigious award a U.S naval ship can earn, said Urnovitz. Winning this a third time is a true testament to Princeton's leadership and culture and the ability to pass those on to future crews. Princeton had several operational highlights during 2017, such as serving as the Air and Missile Defense Commander (AMDC) for the aircraft carrier USS Nimitz (CVN 68) and Carrier Strike Group 11 during her deployment to the 5th and 6th Fleet areas of operation. Additionally, she provided tactical support for Nimitz and other high value units, against various groups of surface contacts. Princeton is a member of Carrier Strike Group 11 and the sixth U.S. Navy ship named for the Battle of Princeton. The ship was commissioned in 1989 in Pascagoula, Mississippi, and has completed three deployments to the Arabian Gulf, and won two consecutive Battle Efficiency Awards in 1992-1993, and unit tactics and retention excellence awards in 2017.